Photography by Anne Grace Photography. 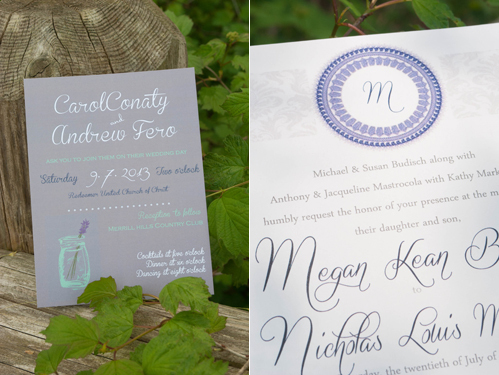 Sending wedding invitations can at times be the most stressful part of planning a wedding. Who should you invite? Should we invite kids, too, or just adults? What about dates? Q: How should a couple address their invitations when they don’t want to allow guests to bring a date? A: Wedding etiqutte has indeed changed over the years. 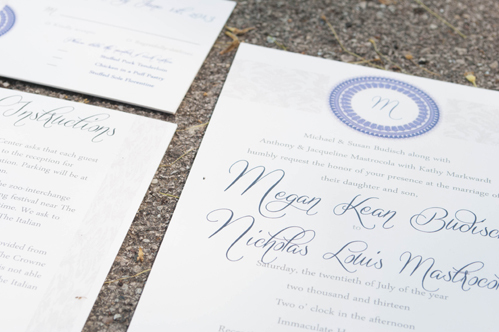 Often times the way a bride and groom want to address their guests is not the same way their parents would want them to address their invitations. If the wedding is non-traditional; perhaps a Sunday brunch wedding or a cocktail setting with no dinner, making a statement on the invitation or added card within the envelope saying it’s a smaller, intimate setting of just family and friends is appropriate. If you are having a traditional style wedding, addressing the envelope to just the person invited oftentimes is enough for the guest to know that would not include a “plus one” invite. If you are worried that your guests still may invite another guest to accompany them, pre write/type out the RSVP card with just their name provided. This can usually be done by your Invitation Designer as well. Yes, this may take more time away from your already-hectic wedding countdown, but will lead to less confusion as the RSVPs start coming in! Q: Is it appropriate to offer some guests the option to bring a guest, and not others? A: To make sure NO hard feelings are had before or after the wedding, the rule of thumb should be invitees aged 18 and older should bring a plus one, while family/friends under would not require a plus one invitation. Q: If a couple decides not to allow children at the wedding and reception, how should they address invitations if they are only inviting guests over 18? A: When in doubt, plainly state that no children are allowed. This might come with a more eleqount phrase such as “We ask for an adult-only ceremony & reception” clearly stated on the bottom of the invitation, or “Adult reception to follow” if only for reception. In the world of weddings, more invitees means more money. Do what makes YOU happy rather than going broke on the extra invitees. Some say it’s rude, but others do understand that is just the way it needs/has to be for some brides and grooms. 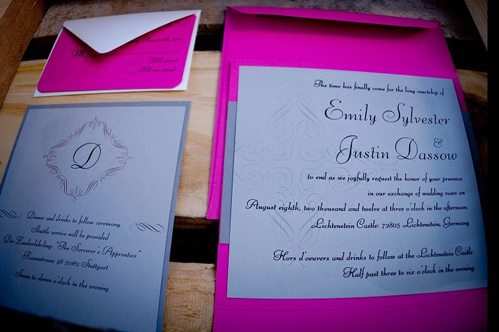 Q: How should a couple handle invitations that are only inviting guests to join them at the reception? Instead of coming to the ceremony & dinner? A: It’s always a great idea to have an entirely new invitation made up for guests only invited to the reception with no dinner or ceremony. Have the invitation look very similiar to the full invitation itself but state something in the lines of “Please join us for cocktails and dancing”. Make sure to allow enough time for the dancing to start and dinner to end so that those guests are not arriving at the end of the meal where some may still be enjoying their tasty meal! Also, it is always a more sincere invite for these guests to receive an actual paper invitation rather than an email or Facebook invitation. Q: What’s the most important piece of advice you would give couples as they begin their journey of creating invitations? A: Try to come to your invitation designer with a few ideas to let them know your style/look of the wedding you are going into. It helps the creative process go more smoothly so that you as the bride/groom know what you like and also allows the designer to understand your wedding feel. Also know your budget. We meet with brides/grooms all the time that love a specific look-perhaps with several mounting cards or pockets or metallics for their invites, but are not able to do so after they understand the price. We work with budgets or allow brides/grooms to construct on their own to save on cost!